U.N. Secretary-General Ban Ki-moon said Friday that the world's current refugee crisis, with more than 70 million displaced people, has become "totally unmanageable" and "uncontrollable." Speaking at the World Bank headquarters in Washington at a panel discussion on the refugee situation, Ban called for political solidarity as the world faces the "biggest refugee and displacement crisis of our time." World Bank President Jim Yong Kim told the panel that development solutions for countries facing refugee problems must come just as quickly as humanitarian help. "We can no longer wait for the humanitarian experts to do their work while we enter later at some point with our long-term solutions after months or sometimes after years. We know we can no longer wait as countries implode and say, ‘Well, this is not our job,’ " he said. Kim said the World Bank is working on a plan to loan money at zero percent interest to groups that will hire refugees. "So how do you solve this problem of so many refugees who don't have livelihoods, who don't have income, and at the same time not just simply burden a country like Jordan with debt?" Kim asked. 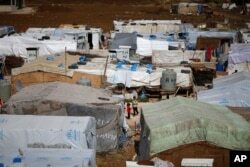 FILE - Syrian refugees stand outside their tents at a Syrian refugee camp in the town of Hosh Hareem, in the Bekaa valley, east Lebanon, Oct. 28, 2015. The panel also featured leaders from Lebanon and Jordan — two of the countries most affected by the Syrian civil war. Queen Rania of Jordan said one out of every seven people in her country is a Syrian refugee. "To put that in context, if the United States received an equivalent influx, it will mean accommodating 50 million refugees. Think about that, 50 million. That's almost 2½ more Floridas, five Ohios, 10 South Carolinas," she said. Queen Rania said the refugee crisis was a global one, adding, "We are deluding ourselves if we think it can be contained. We know all too well in our interconnected world a crisis in one place is a crisis in all places." European Commission President Jean-Claude Junker said the crisis is testing the values and will of the European Union. "It is reminding us that solidarity is not only a moral virtue, but an essential part of the European Union," he said. Migration is one of the defining challenges of the 21st century, and Europe "will be defined by how we respond," Junker said.